Takeaway: ​The road to victory is often riddled with failure, especially if you’re trying to learn something new. Chris Michael is here to point out the top three reasons why vertical farms fail so you can avoid making these mistakes yourself, and get to Vertical Victory much faster. Vertical farming, the practice of growing crops in high density configurations in controlled environments, is the Wild West of modern agriculture. In the past decade, hundreds of vertical farmers around the world have sidelined the concept’s sci-fi roots and built facilities capable of growing high-quality crops closer to market in resource-conscious ways. But like any new industry, failure is inevitable. Though tragic, the failed farms offer one glowing benefit: they allow future farmers to learn and avoid potential missteps. The three took turns weighing in on several questions regarding the history and ultimate end of their farms. In this article, we’ll examine each panelist’s perspective to illuminate three important reasons why vertical farms fail. 1. They try to do too many things at once. A common pitfall of many vertical farms is attempting to both grow food for market while productizing and selling the technology they’re using to grow their food. New farmers must understand they have only one goal: Sell good food. Everything else comes second. The more time, attention, and money spent trying to productize the system, the less time a grower has to delight their customers with fresh, local food. The same goes with decisions about equipment used to accomplish this goal. Unfortunately, we’ve seen dozens of hard-working farmers invest their time, energy, and financial resources into half-baked ideas that fail, taking their money and dreams of starting a farm down at the same time. The bottom line: Farmers can either grow food or develop technology, but they shouldn’t do both. Attempting to do both, as shown by all three panelists, ends poorly. Farmers wasting time on unproven systems or tinkering with their own tech instead of acquiring customers will ultimately end up out of business due to losing sight of their core objective: Selling food. 2. They forget that labor is always the biggest cost. Reflecting on their own shuttered operations, each of the three panelists echoed this warning about labor: Don’t overlook your labor costs. All three panelists express similar challenges regarding the workers on their respective farms. While the wages were relatively low (ranging from $9-15 per hour), labor costs added up quickly thanks to the farms’ growing techniques. Many of the failed farms ignored ergonomics and were not designed for efficient manual work. 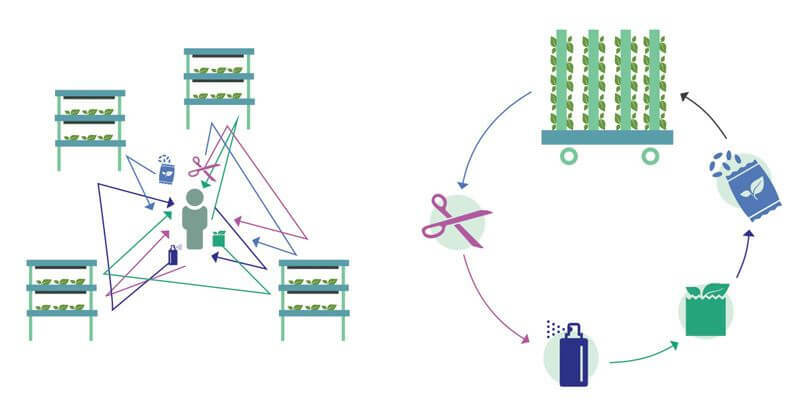 Multi-layered systems with grow beds reaching to the ceiling meant that farmhands had to travel up and down on a scissor lift to perform basic farm operations like planting, inspections, maintenance, and harvesting. The key to workable systems is accessibility. Vertical farms must be seen and touched easily. That means no scissor lifts, no leaning or climbing to get to plants, and no peering through racks to see what’s going on in the system. These systems enable growers to spend more time working with plants or getting more customers. You can find this type of accessibility in vertical planes, which are easy to access visually, and modular systems, which are easy to access physically. Of course, the question of automation came up. Won’t automation solve a lot of the farm labor issues? Maybe, but probably not. At least not for the majority of small producers. The fact is automation equipment requires massive capital investments to build and highly skilled labor to operate—both of which are in short supply at most local farms. And why rely on automation to make farming economically viable? Instead of asking how we can use machines to minimize the cost of human labor, we should be asking how we can design a system that doesn’t need automation to function economically. Again, it all circles back to accessibility. The bottom line: Farmers should implement a growing system that reduces labor costs and does not require expensive automation technology to be economically viable. 3. They don’t treat the farm like a process. All three panelists at Aglanta touched on the importance of creating an efficient farm layout and workflow. In today’s technology-based modern farming world, production is not the problem. Growing in controlled environments and with proper plant nutrition allows modern farmers to produce crops with astounding consistency and quality. Instead, the real issue these three farmers faced was how to run their growing operations efficiently while minimizing cost. Hardej says he thinks about any future vertical garden farm as first and foremost a “manufacturing and production process.” Treating the farm as a manufacturing process, as opposed to an art form, means treating it like an optimization problem. The conventional way of vertical farming using stacked layers puts farm owners and their laborers at the mercy of expensive machinery to access their crops. These production methods are complicated, inefficient, and costly because they require so much time spent traveling up aisles and between layers to do everything from the initial planting all the way to the harvest. The bottom line: When evaluating farm equipment options, look past production. Every system can grow crops, but not every system can optimize workflows and maximize labor efficiencies. The vertical farming industry is just starting to take off. Every day, there are new companies promising to deliver exciting solutions in growing equipment, lighting technology, climate controls, data, sensors, automation, consulting, and much more. And some of these companies will fail. However, if one thing is clear from the Aglanta panel, it’s that we can learn from each other’s mistakes. We now know that exerting more control over the growing environment, making better use of our resources, and implementing smart, labor-efficient growing technology can help us take big strides toward farming success and giving greater access to better food. Through more collaborations like the one at Aglanta, I believe we’ll keep pushing the boundaries of vertical farming and achieve amazing things.